2018 Election Voter Turnout Hit 50-Year High More than 47 percent of the voting-eligible population cast a ballot in the midterm elections on Tuesday, according to early estimates. That's the highest turnout for a midterm since 1966. More than 47 percent of the voting-eligible population cast a ballot in the midterm elections on Tuesday according to early estimates from the United States Election Project. Voter turnout on Tuesday was massive: More than 47 percent of the voting-eligible population cast a ballot in the midterm elections on Tuesday, according to early estimates from the United States Election Project. "Almost half of possible voters actually voted" might not sound impressive. But for a U.S. midterm election, it's a whopping figure. Compare that with just 36.7 percent in 2014, and 41 percent in 2010. 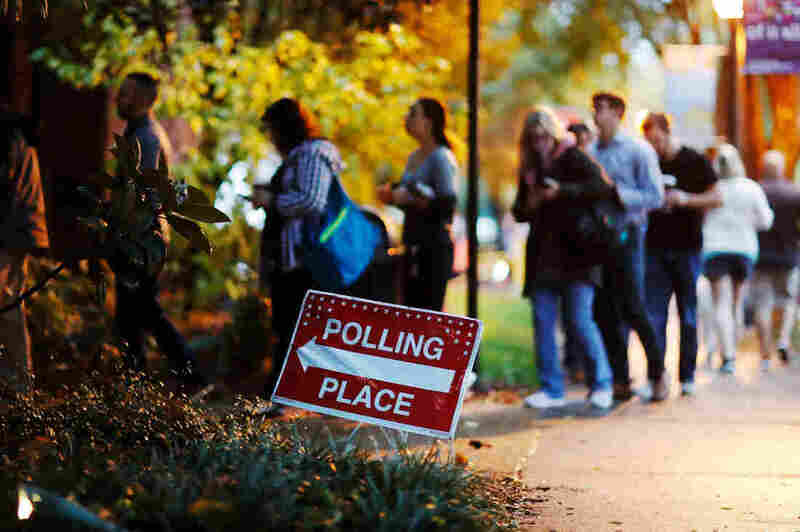 That's the highest turnout for a midterm since 1966, when 49 percent of the population showed up to vote. All told, more than 110 million Americans cast a ballot for their congressional representative in Tuesday's midterm elections, according to a Wednesday estimate from the Election Project. Voter tallies for the House races, as calculated by The New York Times, show that more Democrats voted than Republicans. That was expected, given Democratic outrage at the Trump administration. But the total increase in turnout, compared with 2014, held true for both parties. For weeks, there were hints of a historic surge. Early voting was up ... way up, in some places. In Texas, more people voted early in this election than voted — total — in 2014. As further evidence, polls suggested more people were planning to vote than had in recent midterms. All signs pointed toward massive voter participation, and on Tuesday, the American public delivered. Some regions saw particularly robust turnout, driven by competitive state and district races. According to estimates from the Election Project, more than 60 percent of eligible voters showed up in both Kansas and Minnesota. In Kansas, Republican Kris Kobach lost a close race for governor. In Minnesota, two Senate seats, the governor's mansion and several competitive House seats were up for grabs. And Nate Cohn, of the Times, says some individual districts saw turnout at or above 2016 levels, a presidential year. Across the country, people were clearly more interested and more enthusiastic about this election than for most midterms. For Democrats, heading to the polls on Tuesday was framed as an act of resistance against Trump, both symbolically and substantially: By taking control of the House, Democrats will be able to exert a measure of oversight over the administration that was previously impossible. Meanwhile, the president — after confidently boasting of a "red wave" — went on a blitz of rallies and told his Republican base to vote as though his name was on the ballot. The sharp rise in turnout came amid concerns over voter suppression. Many more voters were purged from registration rolls between 2014 and 2016 than in previous years. That has raised concerns about people losing the right to vote, although striking names from registration rolls is part of the standard process for states. Meanwhile, multiple states have passed laws that make voting more difficult; some of those laws have been struck down, while others are in place. And many Republican leaders and officials have sounded a vigorous alarm over voter fraud, which is extremely rare. Civil rights groups say such efforts amount to voter intimidation. High voter turnout doesn't mean voter suppression efforts were nonexistent or ineffectual. Myrna Perez, deputy director of the Brennan Center's Democracy Program, told PolitiFact that high voter turnout overall could mask suppressed turnout in some populations, like people without IDs. In some cases, suppression efforts can even backfire. Consider a North Dakota rule that requires voter IDs to list physical street addresses, which many Native Americans living on reservations do not have. When the law went into effect just weeks before the election, tribes were left scrambling to print new IDs. Jamie Azure, the tribal chairman of the Turtle Mountain Band of Chippewa Indians, believes the law was designed to suppress the Native vote. But, he told NPR, tribes across the state unified to "figure out a way to to go over the barriers that that are put in front of us," he said. "And this unified movement moving forward with the tribes? That's going to jump our percentages up, with that Native vote." The Center for Public Integrity reports that Native voter turnout was, indeed, up sharply in North Dakota. One tribal region more than doubled the number of voters, compared with in 2014.